This book is a concise, easy-to-use resource for applying marketing strategies to a foodservice facility, addressing issues like: How do I market my restaurant to prospective customers? Do loyalty programs really work in restaurants? How does the design of my restaurant and menu affect the perception of my operation? 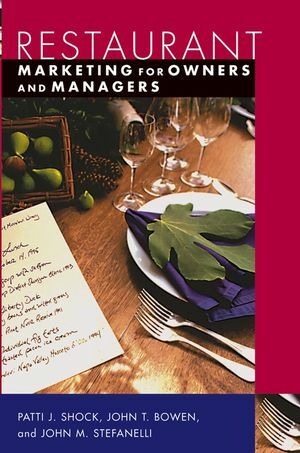 This text provides the restaurant/foodservice manager with specific tools tying marketing theory to practice. It also includes checklists and examples that can be applied to the day-to-day operation of their business. PATTI J. SHOCK, CPCE, is a professor and Chair of the Tourism and Convention Department of the William F. Harrah College of Hotel Administration at the University of Nevada, Las Vegas. JOHN T. BOWEN is the Dean of the Conrad N. Hilton College of Hotel and Restaurant Management at the University of Houston where he also holds the Barron Hilton Distinguished Chair. JOHN M. STEFANELLI, PhD, is a professor and Chair of the Food and Beverage Department of the William F. Harrah College of Hotel Administration at the University of Nevada, Las Vegas. 1. Introduction: What Am I Getting Myself Into? 2. Location: Where Am I Going to Put This Place? 3. Environmental Analysis: What Am I Up Against? 4. Identifying Markets: Who Are My Customers and What Do They Want? 5. Menu Development: What Should My Sales Kit Look Like? 6. Pricing: What Should I Charge for This Stuff? 7. Service: How Do I Get My Staff to Give the Right Amount of Attention? 8. Other Income Streams: How Much Extra Stuff Can I Sell? 9. Communications: How Do I Get on the Guest’s Radar Screen? 10. Technology: How Do I Surf My Way to Success? 11. Marketing Plan and Budget: How Do I Figure Out What to Do and How Much It Will Cost? Offers practical advice on how to use marketing to create a successful restaurant. Presents strategies that link location and design of restaurant with its menu and pricing. Illustrates how to put together a marketing plan and budget.